Everyone’s favorite Navy Yard industrial icebox turned gallery is at it once again with a new exhibition by artistic duo Chiaozza. 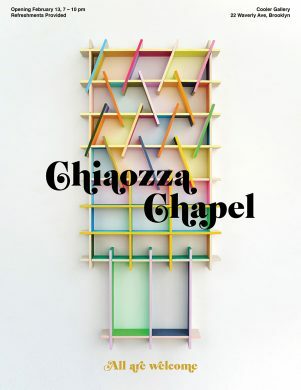 While their show’s name, Chiaozza Chapel, may sound like an old piece of ornate architecture you’d learn about in art history class, their work is certainly very modern. However, it’s still an actual chapel, at least in the formal sense of the word. The duo has transformed a small 6’x7’ section of the space into a colorful, geometrical space for contemplation and gathering. If you’re old-school, think of the structure within as a kind of modernized, minimalist stained glass. Personally, I think it kind of looks like a nice, stylish condo for birds. Opening Thursday, February 15 at Fort Gansevoort, 6 pm to 8 pm. On view through March 24. Usually when art exhibitions have their opening receptions– a cultural obligation that usually involves free wine– they take place in the gallery among the art itself. Sam Stewart’s exhibition at Fort Gansevoort is a little bit different, seeing as it’s not technically at Fort Gansevoort. Cryptid is primarily a furniture exhibition, and takes place in a residentially-zoned townhouse next to the gallery. 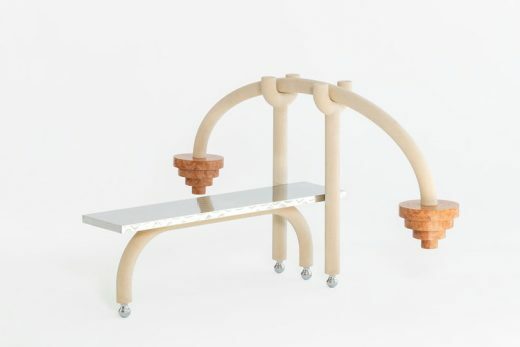 As the zoning requires the space to have “a shower in the bathroom, a sleeping surface, and a working kitchen among other prerequisites,” the sculptural pieces displayed also function as these domestic facets. However, don’t expect to see just some typical toilets and countertops. This is the house of a cryptid, a mythic creature like that of Bigfoot, but if Bigfoot was also trying to build a personal brand in the year 2018. We can only imagine how much rent must be. Opening Thursday, February 15 at Camera Club of New York, 6 pm to 8 pm. On view through March 10. No matter who you are, there’s probably something weird about your body. Not in a disparaging way, just that bodies are all strange in about a million different ways and that’s just how it is. 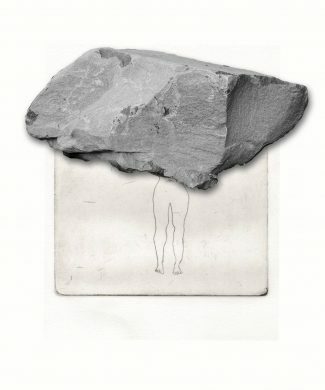 But even stranger can be the absence of bodies, which is a driving force behind Nandita Raman’s solo exhibition of photography, drawing, found text, traveler’s diaries, and more. The show is based around the curious nature of her hometown, India’s Varanasi. Working with the central inquiry, “How do I experience my body as I traverse the city full of female deities but where women are conspicuously absent from public spaces?,” Raman creates work that functions as a self-portrait, a case study of her surroundings, and a dive into the wide world of gender performativity. Image: Carrie Yamaoka, 14.125 by 11.625 (black & white #3), 2015. cast flexible urethane resin, reflective mylar and mixed media.14.125 x 11.625 x .375 in. Copyright the artist (Left). Opening Saturday, February 17 at Leslie-Lohman Museum of Gay and Lesbian Art, 4 pm to 6 pm. On view through various dates. Come Saturday, not one but three springtime exhibitions will be opening in the recently renovated Leslie-Lohman Museum, which thankfully still manages to make Soho a little less of a capitalist haze. 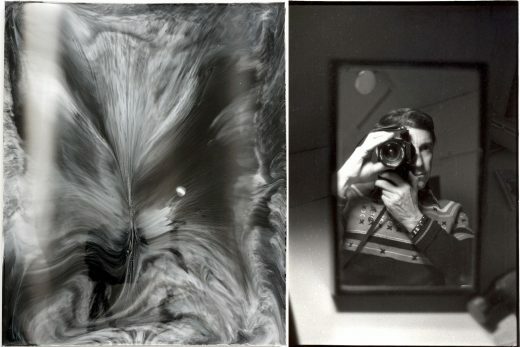 The first one is an assortment of self-portraits predominantly by the gay photographer Leonard Fink, who was fairly unknown as an artist both during his lifetime and afterward. He was drawn to photographing queer life around the West Village, particularly at the piers and the bars, and his images will be paired with similar work from other artists. Haptic Tactics is a group show concerning contemporary abstract art through the lens of queerness and eroticism, and Stations of the Cross is an interfaith public art project with 14 components (one of which is in the museum) telling diverse tales of injustices.